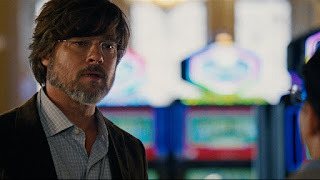 A sharp and irreverent take on the 2007 housing market collapse that precipitated the Great Recession, The Big Short excels at transforming a dry subject into a gripping, character-based financial thriller. The film focuses on the few independent-minded investors who foresaw the rot at the heart of mortgage backed securities and bet heavily that the banks, rating agencies and regulators did not know what they were doing. 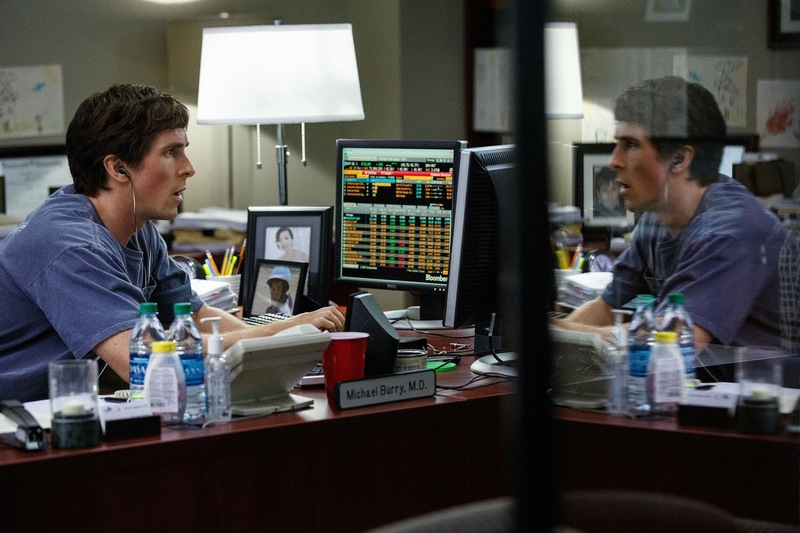 Michael Burry (Christian Bale) is a socially awkward investment fund manager. He digs deep into reams of data, and confirms his instinct that too many mortgages are high-risk. He practically invents shorting the housing market, and the banks are happy to take his money, confident that real estate can only ever go up. 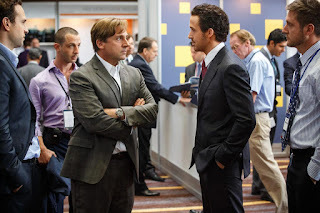 Banker Jared Vennett (Ryan Gosling) hears about Burry's play and approaches Mark Baum (Steve Carell), a pessimistic, high-strung investment fund manager. Baum's research team uncover huge mortgages being approved to unqualified buyers, using teaser rates to simulate affordability and the promise of a remortgage against a higher house value. With the number of buyers dwindling and a high proportion of teaser rates expiring in 2007, Baum arrives at the same conclusion as Burry and bets big with Vennett that the mortgage market will collapse. He is further horrified when he realizes that bundled bad investments in the form of "collateralized debt obligations" (CDO) and secondary and tertiary "synthetic" CDOs are flooding the market, amplifying the risks to the economy. Small-time young fund managers Charlie Geller (John Magaro) and Jamie Shipley (Finn Wittrock) stumble onto Vennett's findings and seek the help of Ben Rickert (Brad Pitt), a retired banker who quit the financial industry in disgust. The trio along with Vennett, Baum and his team converge on the annual mortgage securities forum in Las Vegas to meet the bankers bundling and selling mortgage backed securities and CDOs, trying to understand whether the industry is corrupt, stupid or both. An adaptation of the Michael Lewis book directed by Adam McKay, The Big Short deploys a disarmingly light touch to makes a serious and complicated topic accessible. Characters regularly break the fourth wall to talk directly to the audience, while on three occasions the film is interrupted to allow celebrities like Margot Robbie (in a bathtub), Anthony Bourdain (in a fish kitchen) and Selena Gomez (at a blackjack table) to demystify the needlessly complicated jargon that Wall Street traders hide behind. The end result is a quite ingenious semi-documentary. 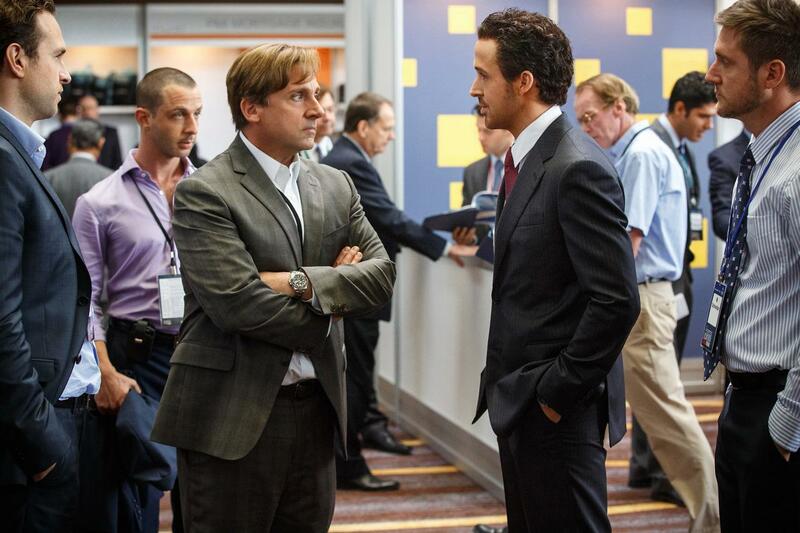 The Big Short is fast-paced, glitzy, funny, brash, flippant and derisive when it needs to be. This is not a story that has heroes and villains, just bankers blinded by greed and investors who spot an opportunity to profit from incompetence. It is also a story of how it takes outsiders to see what insiders cannot, and the strength of conviction required to swim against the masses. The film particularly shines as a study of Burry and Baum, two dissimilar individuals who nevertheless share a healthy disrespect for what constitutes prevailing wisdom. The script by McKay and Charles Randolph sketches in a background for each, but it is left to excellent performances from Christian Bale and Steve Carell to bring to life the dangerously dogged determination that Burry and Baum both deploy to stick to their beliefs. The contrasting styles to arrive at similar conclusions is fascinating. Burry is very much the loner, a numbers man, routinely isolating himself from the world to listen to thumping heavy metal music while fending off panicked investors threatening to either pull their money or sue him as the long awaited collapse is temporarily but agonizingly staved off by the increasingly desperate banks. Baum is acerbic, intrusive, a bull in a china shop and joins his team in on-the-ground research that includes interviewing over-leveraged strippers with multiple mortgages and brokers happy to sell expensive homes to poor immigrants who cannot understand what they are signing. Gosling does a fine if relatively routine job as the slick banker and narrator Vennett, one of the few insiders who grabbed the opportunity to bet against his own industry. The stellar cast also includes Melissa Leo in one scene as a literally and figuratively near-blind securities rating agent, and Marisa Tomei as Baum's long-suffering wife. Amidst the dizzying pace of a stock market on a head-long rush towards a cliff, McKay does also serve reminders of the human tragedy that is about to unfold. Rickert and Baum both have corners of their souls that are tortured by the true societal cost, measured in despair, poverty, unemployment and indeed unnecessary death, that is about to be unleashed by the housing market collapse. But in a measure of pervasive greed trumping all, both men don't mind deriving enormous profits from the impending economic catastrophe. Rickert has signed off on a career as a banker but comes back to help enrich youngsters Geller and Shipley, while Baum perceives the crisis as his long awaited chance to stick it to a system he has always perceived as inherently corrupt. Yes there will be millions of devastated innocent victims when the economy tanks, but true to the most fundamental principles of capitalism, somebody may as well profit.